Industrial district, Area planning available. 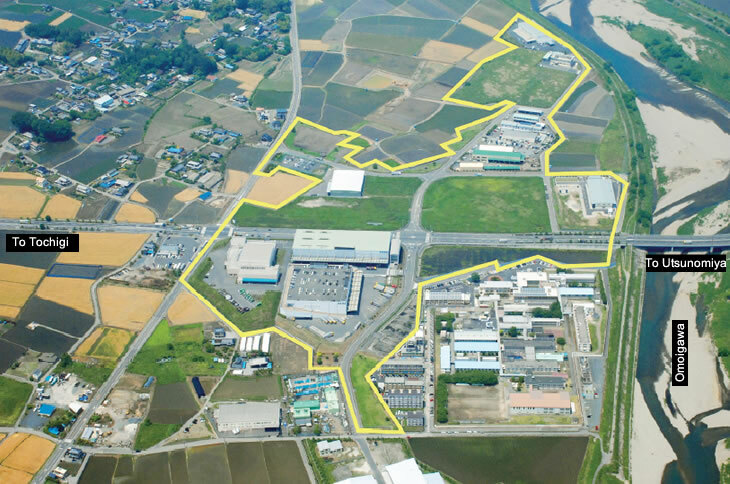 Building coverage ratio: 60%, Floor area ratio: 200%..
To enter into a Pollution Control Agreement based on the Tochigi Living Environment Preservation Act, and to make a contract with local 2 parties. To drain by exclusive drainage pipe after the processing (BOD 8 mg./liter or less) by each company individually. Optical fiber cable is available. 2 km, 3 minutes by car, from Nozu-otsuka station on Tobu Nikko Line. 8km, 12 minutes by car, from JR Jichi-idai station on JR Utsunomiya Line. 11km, 20 minutes by car, from JR Oyama station on JR Utsunomiya Line, or Tohoku Shinkansen. 7 km, 10 minutes, from National Route 4. 8 km, 13 minutes, from the Tochigi interchange on the Tohoku Expressway. 9 km, 15 minutes, from the Mibu interchange on the Kitakanto Expressway. 7 km, 12 minutes by car, from Tochigi city hall. Invested fixed assets amount: 100 million yen or more（for facility for selling goods: 200 million yen or more). Number of full-time employees living in the city: 5 ore more（for facility for selling goods: 10 or more). To start the operation of the factory,etc. within 5 years from the acquisition of the land. Period of grants: For 5 years. To satisfy the requirements for the Location Incentives. To acquire the land from the property agents. Amount of grants: 10% of the land acquisition cost.